Looking to upgrade my suspension and have considered many brands. The past 14 months or so my M2 has only been driven for fun, b road blasts and tracks days. With this in mind it isnt a daily driver at all and handling, composure and feedback are a higher priorty to me. After much consderation I have narrowed it to the Bilstein PSS10S vs AST5100 (litchfield spec) vs Ohlins road and track. Ohlins only appear to give a 10mm drop so not much adjustability. Would be very interested to hear any feedback from any of these and of course open to new ideas. I had considered KW and mperformance but decided against it. Last edited by sawda on Mon Jan 15, 2018 7:54 pm, edited 1 time in total. I had considered KW and mperformance but decided against it. What's your current setup ? Why not KW or MP coils ?? Currently on eibach springs and spacers since march last year. After a few track days I thought I would ditch the springs in hope of getting more feed back and even better more planted handling. Been reading and many articles and forums and talking to enthusiast, suppliers and retailers a like and you start to build a picture. It all so very subjective I try to keep an open mind. For example I may go out and buy the Bilsteins and say that they are amazing, my background but I have nothing to compare it to aprat from stock and have never purchased coilovers before so my opinion would be slightly one dimensional. KW seems to have some good reviews on the surface but dig a little deeper and their quality seems dosnt seems to be as good as others. Alot of e90/ e46 owners have removed their old kws in favour of Bilstein. Litchfield use Bilstein as well as Evolve, however on the recent Litchfield M2 review from Top gear and autocar they said the AST suspension they fitted was "transformative", strong words. Ohlins again is a step up in quality, ride height only drops 10mm though and is priced more. Been reading and many articles and forums and talking to enthusiast, suppliers and retailers a like and you start to build a picture. It all so very subjective I try to keep an open mind. For example I may go out and buy the Bilsteins and say that they are amazing, my background but I have nothing to compare it to aprat from stock and have never purchased coilovers before so my opinion would be slightly one dimensional. Sounds you like you doing the right things in terms of reading up/understanding before committing any funds. KW and Billy’s are similar price point whereas Ohlins and AST are a step up in terms of cost. There’s many more who have installed KW and Billy’s so more feedback on longevity more readily available, including NISFAN on here (who had a F3x with Billy b16 and covered 50k+ miles). Very little written about ohlins and AST in this regards. Had read that depending on useahe, ohlins are rebuildable and may need TLC more frequently. Spoke to a Julian @ turnermotorsport, wow what a knowledgable guy. From talking to him he seems like a suspension Guru and spoke highly of the B16s for both road and track. AST and ohlins do seem to have superior dampers and over all quality but dosnt seem Bilstein is too far behind. What has finally swung it for me was price. B16s can be had for significamtly less then the other two options at the moment (seems to be a bit of a sale going one). Still and excellent and versitile coliover just no so many installed on M2s, plus I felt like being a little different as the KW v3s seem to be the go to. K have been researching over the past few months and I think im going for the B16s. Not sure if many others are running it on here but at least well have another variety to share. Spoke to a Julian @ turnermotorsport, wow what a knowledgable guy. From talking to him he seems like a suspension Guru and spoke highly of the B16s for both road and track. I think im going for the B16s. Not sure if many others are running it on here but at least well have another variety to share. TBH - I was closing in on Billy b16 too. However, having driven a car with MP coils, the positive effect of adding OE MP coils as far as RV when financing the car and Rybrook BF deal for MP coils making OEM upgrade a no brainer for me. Look fwd to reading yr feedback once Billy b16 installed on yr m2. 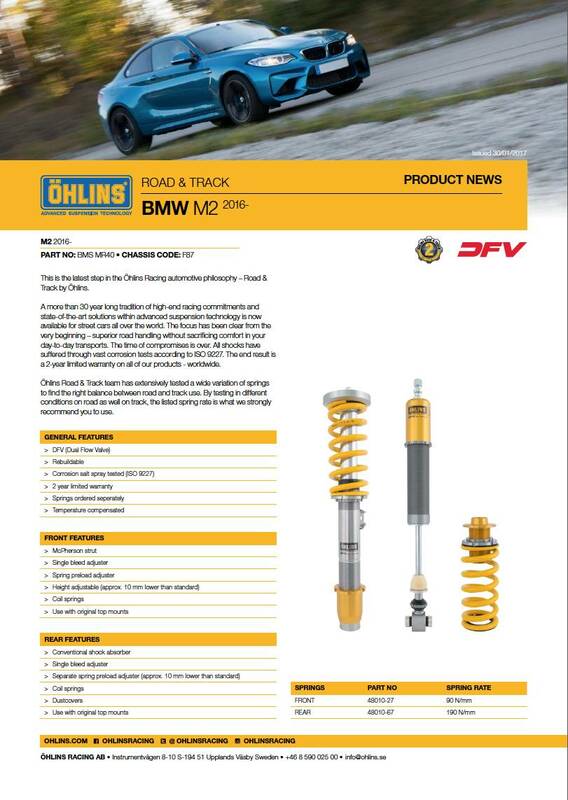 Are you sure the Ohlins only lower up to 10mm and it’s not some TUV stipulated text around recommendation? Have you checked out the ACS RS suspension set up? Black Friday deal was very good indeed, and almost regret not going for it. I did email rybrook about a week ago to see what the deal is now but still not heard back. Anyway deposit down for the PSS10s . Feel confident they will be a huge leap forward so lets hope im not dissapointed. From the feedback from the MPC it seems that coilovers are the way forward so will report back once fitted and driven around. Got a couple of tracks days booked too so should be fitted well before then. IIRC - ACS RS kit for m2 is a rebadged KWV3 set with a circa 20% price hike. Don’t wish to take this thread off track, but does anyone know if the BMW M performance spring kit from M3 / M4 fit the M2? I mean the HAS style kit with adjustable spring perch and helper spring for rear. Yes it does fit but pricey option given KW makes an HAS m2 kit which is cheaper and has matched springs suited more to m2 weight and m2 dampers.